Located just outside Kovalam, in a quiet location, Surya Samudra enjoys the sunshine, warmth and sandy beaches of southern India. It’s the perfect yoga holiday for solo travelers, couples and friends and best experienced from November to April. The area is a gorgeous corner of Kerala, boasting stunning beaches and beautiful backwaters; however, apart from relaxing on the beach and exploring the local surrojndings, the principal reason for visiting Surya Samudra is its daily yoga, fantastic spa and the wealth of Ayurvedic treatments – one of the oldest forms of treatment, this traditionally Hindu system of medicine balances the mind, body and sprit to achieve a finely balanced state of total wellbeing. Guests on this yoga holiday enjoy full board, daily yoga and 90 minutes of Ayurvedic spa treatments every day, ensuring that a stay at Surya Samudra leaves every guest feeling rejuvenated, balance and at peace. Originally a private house, Surya Samudra is now a charming boutique resort with spectacular views of pristine beaches and the Arabian Sea. There are 22, all en suite rooms at this eco-friendly resort that are both stylish and comfortable. 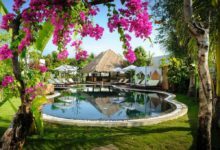 The expansive tropical gardens, in which the resort is set, beg to be explored, while the resort’s location, delicately perched high on top of the cliffs, overlooks two almost private white sand beaches. Many of the rooms are actually authentic Keralan houses transplanted from their original derelict locations to the hillside that slopes towards the coast. They have heavy wooden doors and window shutters and the interiors are finished in traditional style, with outdoor garden bathrooms. All rooms face the sea to get the full effect of the cooling breezes. Yoga is practiced at the pavilion overlooking the twin bays separated by a granite promontory, giving each session an inspiring backdrop. There is also a unique pool hewn from the hillside and featuring exposed boulders. Other activities at the hotel include catamaran and motorboat rides, astrology, cooking classes and selection of cultural experiences to explore the stunning local landscape. The open restaurant serves a variety of local and delicious food, including seafood freshly caught by local fishermen. This yoga holiday is also full board, ensuring you don’t have to worry about food during your holiday. Prices are based on visiting in low season but we can put together a quote for you for any number of nights you’d like to be away. We can also help you organise your flights and airport transfers to ensure a stress free trip! Let us know if you have any questions about our trips. Also, if you are looking for a yoga holiday on dates to suit you (because none of our hosted group yoga retreat dates work for you), please let us know the dates you are interested in.